Home » Armenian Myth » Have the Turks always attacked and misruled Armenians throughout history? Armenian propagandists in recent times have claimed that the Turks mistreated nonMuslims, and in particular Armenians, throughout history in order to provide support for their claims of "Genocide" against the Ottoman Empire, since it would otherwise be difficult for them to explain how the Turks, who had lived side by side with the Armenians in peace for some 600 years, suddenly rose up to massacre them all. The Armenians moreover, have tried to interpret Turkish rule in terms of a constant struggle between Christianity and Islam, thus to assure belief in whatever they say about the Turks on the part of the modern Christian world. "Melikshah’s heart is full of affection and good will for Christians; he has treated the sons of Jesus Christ very well, and he has given the Armenian people affluence, peace, and happiness." "Kilich Arslan's death has driven Christians into mourning since he was a charitable person of high character." Turkish tradition and Muslim law dictated that non-Muslims should be well treated in Turkish and Muslim empires. The conquering Turks therefore made agreements with their nonMuslim subjects by which the latter accepted the status of zhimmi, agreeing to keep order and pay taxes in return for protection of their rights and traditions. People from different religions were treated with an unprecedented tolerance which was reflected into the philosophies based on good will and human values cherished by great philosophers in this era such as Yunus Emre and Mevlana Celaleddin Rumi who are well-known in the Islamic world with their benevolent mottoes such as "having the same view for all 72 different nations" and "you will be welcome whoever you are, and whatever you believe in". This was in stark contrast to the terrible treatment which Christian rulers and conquerors often have meted out to Christians of other sects, let alone non-Christians such as Muslims and Jews, as for example the Byzantine persecution of the Armenian Gregorians, Venetian persecution of the Greek Orthodox inhabitants of the Morea and the Aegean islands, and Hungarian persecution of the Bogomils. The establishment and expansion of the Ottoman Empire, and in particular the destruction of Byzantium following Fatih Mehmed's conquest of Istanbul in 1453 opened a new era of religious, political, social, economic and cultural prosperity for the Armenians as well as the other non-Muslim and Muslim peoples of the new state. The very first Ottoman ruler, Osman Bey (1300 - 1326), permitted the Armenians to establish their first religious center in western Anatolia, at Kutahya, to protect them from Byzantine oppression. This center subsequently was moved, along with the Ottoman capital, first to Bursa in 1326 and then to Istanbul in 1461, with Fatih Mehmed issuing a ferman definitively establishing the Armenian Patriarchate there under Patriarch Hovakim and his successors. As a result, thousands of Armenians emigrated to Istanbul from Iran, the Caucasus, eastern and central Anatolia the Balkans arid the Crimea, not because of force or persecution, but because the great Ottoman conqueror had made his empire into a true center of Armenian life. The Armenian community and church thus expanded and prospered as parts of the expansion and prosperity of the Ottoman Empire. The Gregorian Armenians of the Ottoman Empire, like the other major religious groups, were organized into millet communities under their own religious leaders. Thus the ferman issued by Fatih Mehmed establishing the Armenian Patriarchate of Istanbul specified that the Patriarch was not only the religious leader of the Armenians, but also their secular leader. The Armenians had the same rights as Muslims, but they also had certain special privileges, most important among which was exemption from military service. Armenians and other nonMuslims generally paid the same taxes as Muslims, with the exception of the Poll Tax (Harach or Jizye), which was imposed on them in place of the state taxes based particularly on Muslim religious law, the Alms Tax (Zakat) and the Tithe (Öşür), from which non-Muslims were exempted. The Armenian millet religious leaders themselves assessed and collected the Poll Taxes from their followers and turned the collections over to the Treasury officials of the state. The Armenian community expanded and prospered as a result of the freedom granted by the sultans. At the same time Armenians shared, and contributed to, the Turkish-Ottoman culture and ways of life and government to such an extent that they earned the particular trust and confidence of the sultans over the centuries, gaining the attribute "the loyal millet". Ottoman Armenians became extremely wealthy bankers, merchants, and industrialists, while many at the same time rose to high positions in governmental service. In the l9th century, for example, twenty- nine Armenians achieved the highest governmental rank of Pasha. There were twenty two Armenian ministers, including the Ministers of Foreign Affairs, Finance, Trade and Post, with other Armenians making major contributions to the departments concerned with agriculture, economic development, and the census. There also were thirty-three Armenian representatives appointed and elected to the Parliaments formed after 1876, seven ambassadors, eleven consulgenerals and consuls, eleven-university professor, and forty-one other officials of high rank. Over the centuries Armenians also made major contributions to Ottoman - Turkish art, culture and music, producing many artists of first rank who are objects of praise and sources of pride for Turks as well as Armenians in Turkey. The first Armenian printing press was established in the Ottoman Empire in the l6th century. Thus the Armenians and Turks, and all the various races of the Empire lived in peace and mutual trust over the centuries, with no serious complaints being made against the Ottoman system or administration, which made such a situation possible. It is true that, from time to time, internal difficulties did arise within some of the individual millets. Within the Armenian millet disputes arose over the election of the patriarch between the "native" Armenians, who had come to Istanbul from Anatolia and the Crimea, and those called "eastern" or "foreign" Armenians, who came from Iran and the Caucasus. These groups often complained against each other to the Ottomans, trying to gain governmental support for their own candidates and interests, and at the same time complaining about the Ottomans whenever the decisions went against them, despite the long-standing Ottoman insistence on maintaining strict neutrality between the groups. 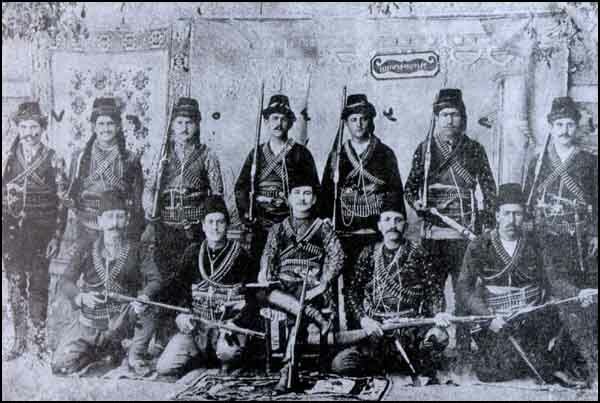 The gradual triumph of the "easterners" led to the appointment of non-religious individuals as Patriarchs, to corruption and misrule within the Armenian millet, and to bloody clashes among conflicting political groups, against which the Ottomans were forced to intervene to prevent the Armenians from annihilating each other. These internal disputes, as well as the general decline of religious standards within the Gregorian millet led many Armenians to accept the teachings of foreign Catholic and Protestant missionaries sent into the Empire during the l9th century, causing the creation of separate millets for them later in the century. The Armenian Gregorian leaders asked the Ottoman government to intervene and prevent such conversions, but the Ottomans refrained from doing so on the grounds that it was an internal problem which had to be dealt with by the millet and not the state. Bloody clashes followed, with the Gregorian patriarchs Chuhajian and Tahtajian going so far to excommunicate and banish all Armenian Protestants.6 Later on, serious clashes also emerged among the Armenian Catholics as to the nature of their relationship with the Pope, with the latter excommunicating all those who did not accept his supremacy, forcing the Ottomans finally to intervene and reconcile the two Catholic groups in 1888. "The great Turk is governing in peace twenty nations from different religions. Turks have taught to Christians how to be moderate in peace and gentle in victory." "Despite the great victory they won, Turks have generously granted to the people in the conquered regions the right to administer themselves according to their own rules and traditions." Politis who was the Foreign Minister in the Greece; Government led by Prime Minister Venizelos: "The rights and interests of the Greeks in Turkey could not be better protected by any other power but the Turks." "It is an undeniable historic fact that the Turkish armies have never interfered in the religious and cultural affairs in the areas they conquered. " "Unless they are forced, Turks are the world's most tolerant people towards those of other religions." Even when Napoleon Bonaparte sought to stir a revolt among the Armenian Catholics of Palestine and Syria to support his invasion in 1798 - 1799, his Ambassador in Istanbul General Sebastiani replied "The Armenians are so content with their lives here that this is impossible."